Sitting atop a rocky hill in southern Italy, Matera is one of Italy’s undiscovered cities, rarely visited in favour of the star attractions of Rome, Florence and Venice. But in 2019 this beautiful, historic city will finally get the recognition it deserves as European Capital of Culture. If you’re planning a trip to Italy, here are a few reasons you need to go to Matera in 2019. Around 15,000 people once lived in the network of caves and grottoes Matera is now famous for. There was no running water, no natural light and improper ventilation that led to the spread of disease, and eventually its residents were forced to move into better-equipped homes nearby. 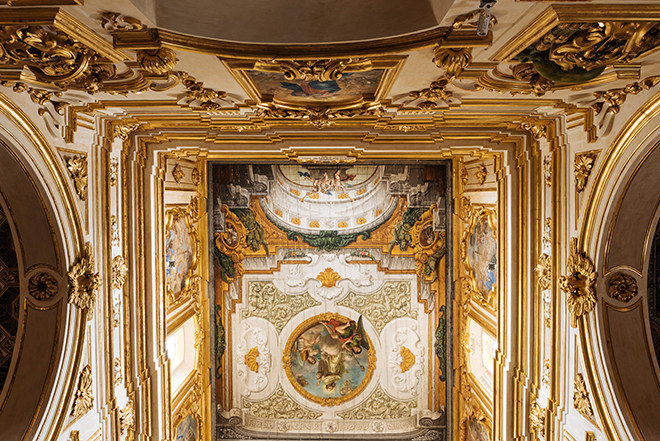 After the Sassi – which literally translates to “the stones” – lay abandoned for years, it began to slowly fill up with artists’ workshops, Airbnb rentals and boutique hotels and eventually became a UNESCO World Heritage Site. 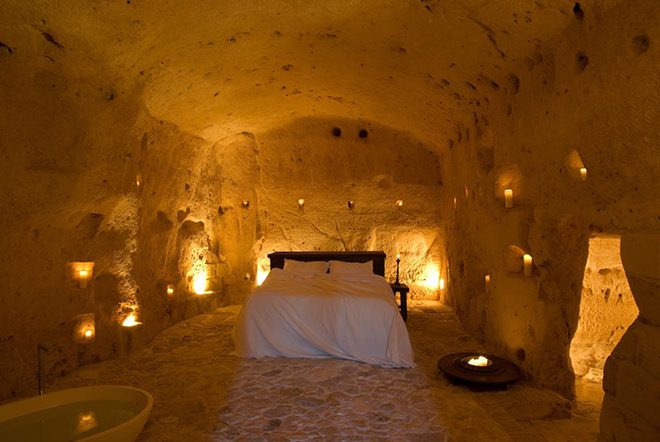 One of the best hotels is Le Grotte Della Civita – a four-star luxury hotel set inside the caves. All natural colours, handmade bedspreads woven on traditional looms, this minimalist yet elegant hotel is a spectacular place to stay in Matera. They offer exclusive, candlelit dining in a deconsecrated church, and Italian cooking lessons if you want to get hands on with local ingredients. There’s bike rental to get out into the nearby Murgia National Park, and in-room massages and Ayurvedic treatments to help you wind down at the end of the day. To learn more about how Matera’s poor once lived in these now-famous caves, take a guided tour of the Ipogeo Materasum. You’ll see original homes carved out of the rock and visit underground churches, and gather a unique understanding of why life here was so difficult for the subterranean city’s residents. The 13th-century cathedral of Matera is a stunning piece of architecture and treasure trove of spectacular artwork from various periods. Marvel at the frescoes, dating back as far as the 1600s, and don’t miss the Byzantine painting of the Madonna and Blessing Child. Another stop for history buffs is the excellent Museo Laboratorio della Civiltà Contadina explores the social history of this agricultural region in Italy. Focusing on peasant lives, it has reconstructions of typical bedrooms, kitchens and religious dwellings, as well as details on the main industries of the time. With its European Capital of Culture status, 2019 will be an exciting year for Matera. Alongside its usual attractions, the city will host a variety of arts and cultural events, from pop-up museums, art galleries, installations and concerts. Themes will include ‘ancient future’, ‘community and disruptions’ and ‘reflections and connections’. Unusual events such as the Edible Orchestra and Quantum Danza – a dance performance inspired by quantum physics – are bound to intrigue. 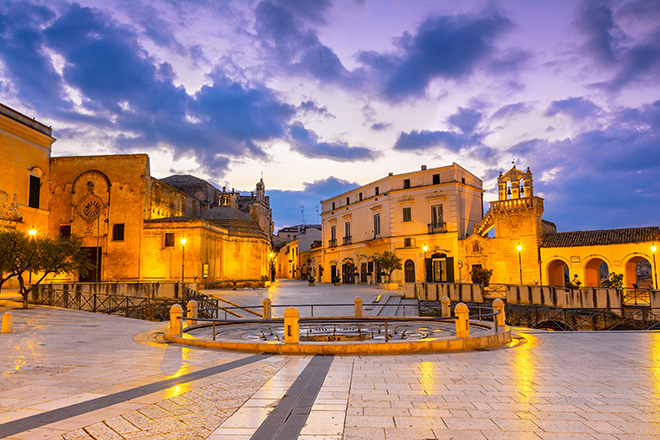 Find out what’s going on in Matera in 2019 here. Just outside of Matera is the Murgia National Park, where easy hiking trails cross a 7,000 hectare space. Look out for hares, foxes, wild boar and even a few wild cats, and stop in to visit one of the many rock-hewn churches for a spot of shade. It’s a beautiful place to spend a day walking, armed with a picnic and bottle of Italian wine.